Holiday weekends generally don’t have as many open houses, so after driving around for awhile, I found myself at 34 Olivehurst in Northpark. HOA dues are $271.40 per month and there are Mello Roos taxes. 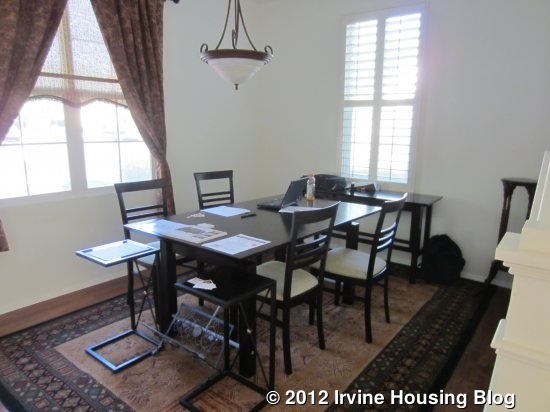 This house is situated on a corner lot, which the realtors refer to as a “prime location.” However, it is on the corner of Spring Valley, one of the main streets that run through the community of Northpark, so it will be busy. The lot is also tiny. 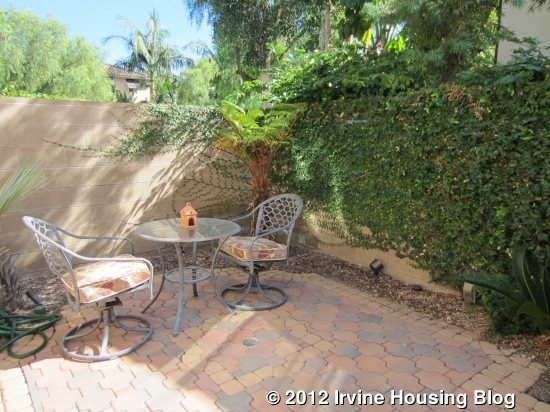 I can’t actually find the lot size listed anywhere, but the fully hardscaped backyard of this house contains a small table and chairs and there really isn’t room for anything else. The garage is on the side of the house and has no driveway. Downstairs, everything is very compartmentalized. The small living room is to the right of the entryway. 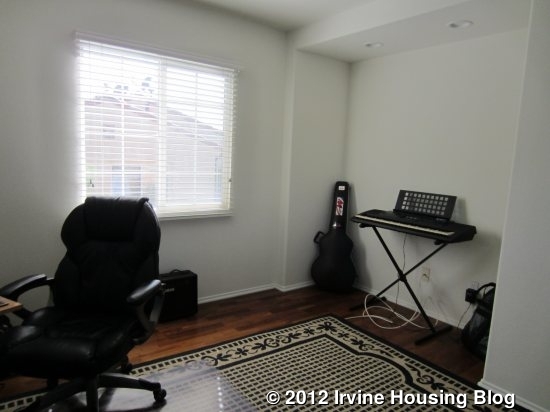 The current owners have one couch and a large entertainment unit and it doesn’t really seem like there is much room to put in a second couch or loveseat. The highlight of the room, and the downstairs in general, are the nice hardwood floors. The dining room is to the left of the entryway. It has windows on two sides and is bordered by the staircase on a third side. Like the living room, it has attractive wood floors. The kitchen is on the other side of the stairway, so it doesn’t connect or flow into the dining room. 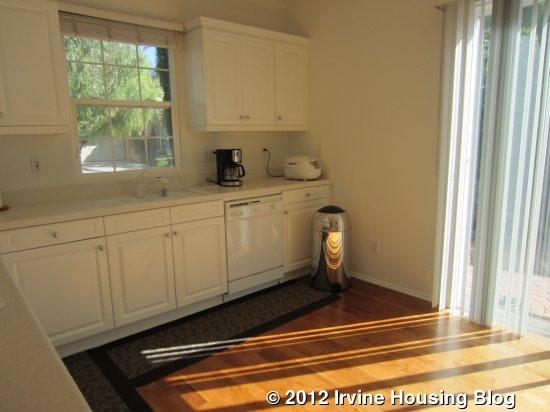 It is a good size, but lacks an island or breakfast nook. 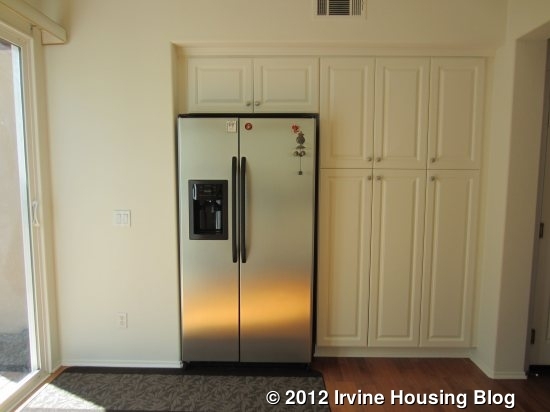 The cabinets and appliances are all white (with the exception of a stainless steel fridge) and even the counters are a very light shade of gray, creating a very monochromatic and somewhat boring look. There isn’t really a place to put a table, so the only option is to eat in the formal dining room for every meal. The only access to the backyard is through a sliding door in the kitchen. Moving upstairs, there is an open loft overlooking the staircase. It is a good-sized room with windows on two walls and a cutout area that could be converted into a closet. 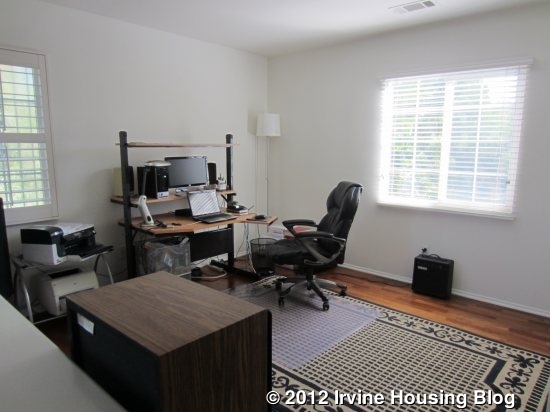 It would be fairly easy to convert it into a third bedroom, but makes a nice office space the way it is now. 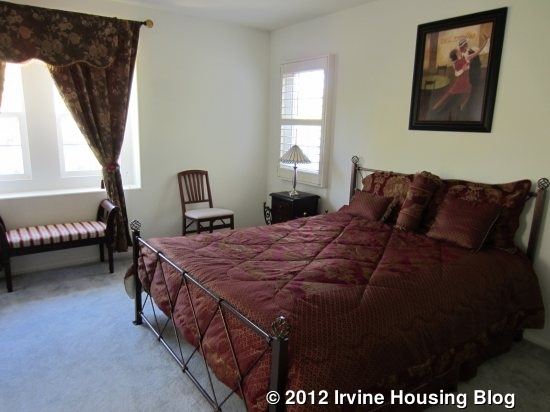 The secondary bedroom also has windows on two walls and a standard two-door sliding closet. While the loft has hardwood floors, the bedrooms, staircase and common areas upstairs have a bluish-gray carpet. It’s in fairly good condition, but I don’t care for the color. 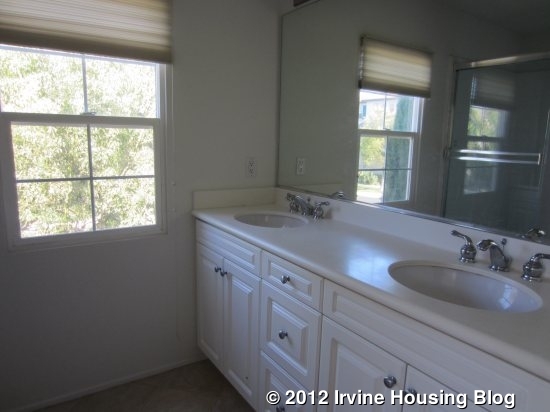 The upstairs bathroom has tile floors, one sink and a shower/tub combo. 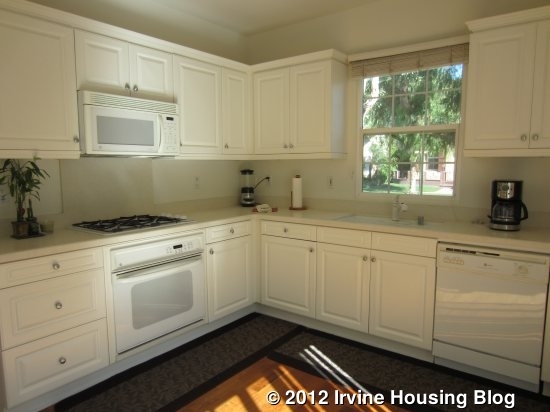 Like the kitchen, it is mostly white. 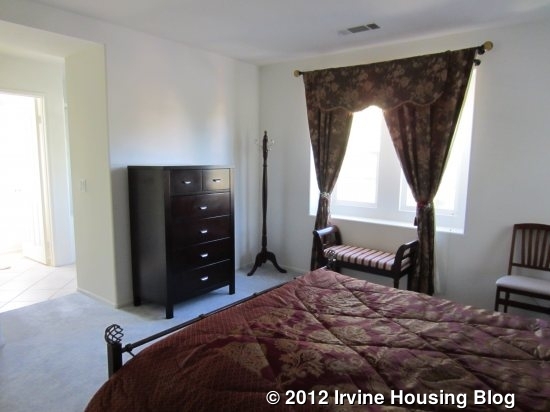 The master bedroom is also unremarkable. It is on the smaller side for a master, especially in a newer home and doesn’t have space for a sitting area. It has one large walk-in closet. The bathroom counters are oddly high and you have to step over a very high wall to get into the shower/tub combo. This bathroom is also all white. The house is in good shape with everything well maintained. However, that is not enough to sell this house. I really dislike the floor plan. The downstairs is too closed off and the living room is too small. The lack of anywhere to eat in the kitchen is a big turnoff. The corner location isn’t good and the lot is tiny. The price per square foot is much too high (higher than most other homes I’ve looked at), especially when you consider that Northpark has high association dues and Mello Roos taxes. And, because it’s in Northpark, you don’t even get the benefit of Irvine schools. I can usually see an upside to most of the houses I visit. This time, I cannot. I’ll be very interested to see what happens with 34 Olivehurst. 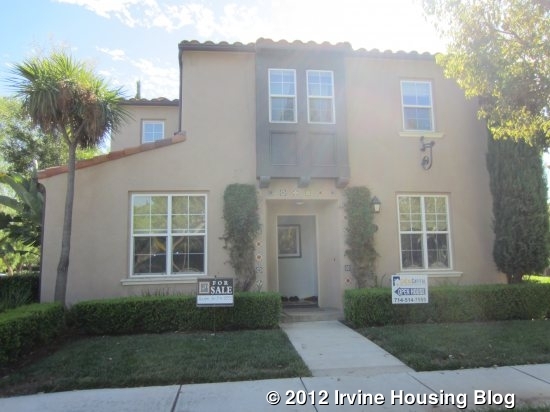 This entry was posted in Real Estate Analysis on September 6, 2012 by Karen. Proof positive that there is still a property bubble in some areas of California. What would be a tiny starter home in most areas in the US, situated on a lot so small it would be illegal in most areas, still goes for over 500K. A joke of the first order.